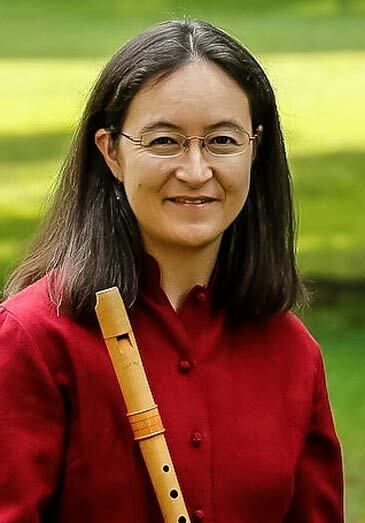 Miyo Aoki is a dedicated recorder player and teacher, performing music ranging from medieval to modern and teaching students of all ages and levels. She has performed in the US, Germany, and Poland, with groups including Farallon Recorder Quartet, Salish Sea Players, Utopia Early Music, and Gamut Bach Ensemble, and at the Bloomington Early Music Festival and Whidbey Island Music Festival. She is a founding member of the Seattle-based chamber group sound|counterpoint and has premiered works by contemporary composers Natalie Williams and Agnes Dorwarth. Miyo holds a KAZ Diplom (Artist Diploma) from the University of the Arts in Bremen, Germany, where she studied with Professor Han Tol. While living in Bremen, she also maintained a private studio and worked in the musical outreach program “Musik-im-Ohr”, based in the Bremen concert hall, Die Glocke. She holds degrees in both early music performance and mathematics from Indiana University, where she studied with Professor Eva Legêne and received the Austin B. Caswell award for her paper on Ars Subtilior music. Miyo is a strong proponent of music education and strives to make music accessible to people from varied backgrounds. She has collaborated in planning and performing several outreach programs for children, including “Shakespeare’s Ear” and “Oskar und die Blockflötendiebe,” and she founded a successful elementary school recorder club program sponsored by Early Music Seattle. She teaches privately and has previously taught for the Indiana University Pre-College Recorder Program, and at various workshops, including the Port Townsend Early Music Workshop, SFEMS Recorder Workshop, Next Level Recorder Retreat, and Road Scholar Early Music Workshop. This will be Miyo's third time teaching at PTEMW. Miyo is quickly becoming recognized as a major asset to early music workshops around the country, and we are happy to have her back with us and so very fortunate that she has chosen to reside here in the PNW! “Kind leadership but firmly in charge”. For those who want to work in-depth on one or two heftier pieces, we will explore the delightful “salads” of Mateo Flecha. These pieces are essentially quodlibets that have it all – sacred, secular, vocal and instrumental all rolled into one narrative work. This is a great way to explore multiple styles and genres within one piece of music, with some fun rhythmic and time change challenges! Step into an Elizabethan household, where a group of friends sit around a table singing and playing music together. With the rise of the Elizabethan middle class, more people were able to purchase printed music to play and sing in their homes. We will sample chart-toppers from John Dowland's popular First Book of Songs or Ayres, along with equally beloved pieces by Byrd and Morley. Their contagious melodies and danceable rhythms will keep you humming all week!